Porsche's production fell 16.0% to 15,353 units in the first quarter. 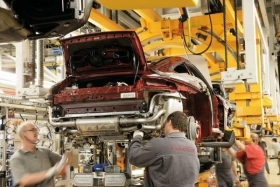 MUNICH -- European auto production increased 23 percent in March to 1,584,431 after a gain of 27 percent in February and a 41 percent rise in the first month of the year, according to estimates from J.D. Power Automotive Forecasting. After three months, output is up 31 percent to 4,246,883 units in western and eastern Europe including Russia and Turkey. The positive first-quarter results are due largely to government-funded scrapping incentives that have lifted new-car sales in key European markets and a comparison with a very bad Q1 2009. A slowing of production in March and February is considered a warning of things to come as incentive programs, which artificially boosted demand last year, run out of cash. The UK's program ended March 31 while Germany's and Italy's subsidies wrapped up months ago. “We still expect this to be a tough year,” Volkswagen AG board member for sale Christian Klingler said in a statement last week after reporting that VW Group's European sales rose 13.5 percent to 837,100 in the first quarter. Klingler and other European auto executives expect Europe's overall 2010 sales will drop by 10 percent – about 1 million to 1.5 million units – compared with 2009. After three month, car sales in Germany, Europe's biggest market, are down 23 percent to 670,410 units. According to PricewaterhouseCoopers, Europe net light vehicle demand will fall by 1 million units this year but production will actually rise 1 percent when compared with 2009. This oddity will happen because automakers dramatically cut output last year by selling from the overstock rather than producing new cars. This not only cut inventory it also helped conserve cash. Thanks to incentives in the other major European markets, most automakers reported production gains in the quarter when compared with Q1 last year, during which time Honda, Audi, Jaguar Land Rover and many others slowed to temporarily stopped their European production lines due to the global economic downturn. Among the losers in Q1 were Smart, Suzuki, Porsche and Saab. Porsche's Q1 output fell 16.0 percent to 15,353 units due to big declines in demand for the 911 sports car and Cayenne SUV. Saab halted production during part of the quarter as it awaited a decision on its future. Saab now plans to make more than 50,000 cars this year, up from just 20,791 in 2009, under its new owner, Spyker Cars NV, which bought the Swedish automaker from General Motors Co. on February 23.